This is probably the #1 biggest fear of travelers venturing off the tour bus for the first time. It can be scary and there are certainly places where I would not recommend driving, but there are even more location that are easier or only accessible by car. 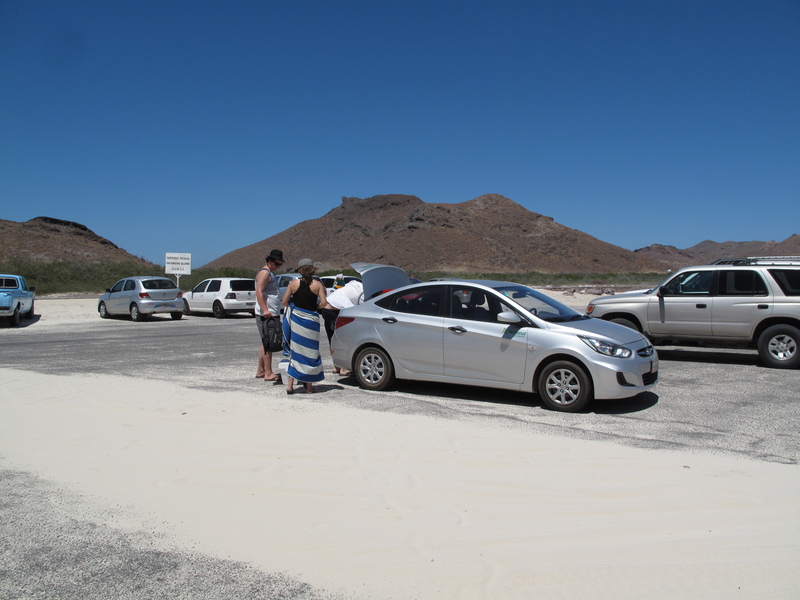 For example bellow is the rental car at Bahai Baladra 20 minutes outside of La Paz – locals only experience you can only reach by car. You must have a drivers license and credit card. Some reputable rental companies only rent to people over 25 years old. You will have the option to purchase additional insurance from the rental agency, BUT most credits cards include rental car insurance when you use that card to pay, don’t pay twice check your credit card has you covered. 1 -Cars are smaller outside the US – to be safe I never get the absolute cheapest compact car, like I would in America. In Europe I step up to the Sedan or coupe option with 2 liter engines so you will have enough power to merge onto a road or go up a hill. 2- Pick up your car outside of city center- In large cities I try and find a rental pick up/drop off on the outside of town or at the airport as it is generally easier to find your way out of the city you are in and on to your next destination. Example: In Edinburgh my family took a taxi from our hotel to the rental car location I selected. I picked my location by looking on a map and finding the road I wanted to take out of town; then selected the rental car on that road but a few miles outside of downtown traffic. 30 nerve-wrecking minutes later I was comfortable driving on the ‘wrong side’ of the road and we were on a freeway looking at a sign that said 32 miles to St. Andrews. 3 – Designate a driver and a navigator – If you are NOT driving you are reading street signs and helping the driver. If you are driving for goodness sake pay attention to the road! Example: I love to drive and do it 2 to 4 hours a day for a living. When we were in Spain I really wanted to drive, so I asked Henry to navigate. But Henry doesn’t speak Spanish and does excel at reading maps. I happen to love reading maps and have a deep internal need to know where I am, so as driver I was not happy being in the dark on navigation. After a heated argument we agreed Henry drives, I navigate and we haven’t fought since. 4 – Follow the rules or pull over – In Europe people are much better at staying on the right side of the road except to pass and they never undertake (pass a car using the right-hand lane). Be aware, watch your speed and if you are lost or going too slow and/or holding up more then 5 cars, please take a minute and pull over. 5- Learn to LOVE the Round-a-bout – It appears America is the last country to figure out the joy of not coming to a complete stop. It works like this; you yield to the cars already in the round-a-bout, you do NOT need to come to a complete stop before entering the round-a-bout. Each road off the Round-a-bout (or exit) should be marked with the towns that road is heading to. Use your turn signal when you are turning off or exiting the round-a-bout. If you can’t read the town names or aren’t sure just go around again. Remember; yield to enter and signal to exit. Example: I drove our rental VW Golf into downtown Lisbon and managed to find our hotel with only minor frustration. When we left 2 days later we were faced with what felt like the worlds largest round-a-bout. It had 6 lanes from the inside to the outside and 7 different exits all with at least 5 towns listed. We tried 5 different exits only to get to the next roun-a-bout and be sent back the direction we came; effectively slingshot-ted right back into the mega-round-a-bout-of-death. I was a completely frazzled driver and Henry a frustrated navigator (see point #3) so this time we went around 4 or 5 times until, used process of elimination and we found a town next to the one we wanted, it wasn’t until we where cruising through the next 4 round-a-bouts that knew we were going the right way. Lesson: If your town isn’t listed look for cities around or between you and your desired destination. Just keep going around until you see where you need to go, other drivers will look at you and honk, just ignore it. Ideally don’t drive in a major European City unless you have to. London – How do the cabbies do it? America – Outside of major cities during rush our this country was made for driving and you really can’t see american unless you have a car. We invented the road trip, live it, love it, drive it. Dubai Abu Dhabi — total car culture and build in the last 50 years everything has parking, signage and new roads in the middle of the desert. In the round-about, were you two following the Griswolds by any chance? Funny enough we were! Thanks for the quality movie reference.